"Use everything as an opportunity to go within! Light your way by burning up obstacles in the intensity of awareness." 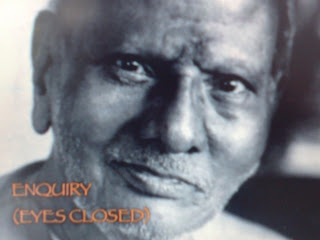 To all appearances Nisargadatta Maharaj looked like a simple bidi seller,(these are small Indian leaf-rolled cigarettes). He was, by all appearances, an ordinary married man, plying his trade in order to support a wife and children. His home was in a red light district of Mumbai, next to a public latrine. He was a man who assumed no airs, but who also, bowed to none, but his Guru. A man whose eyes shone with an inner fire. One day a young Polish-man who had been living many years in India, namely Maurice Frydman, was strolling down a back lane in this particular area of Bombay when he noticed this bidi seller in the midst of an animated conversation with several other men. He had learnt to speak Marathi, the main dialect spoken in Maharashtra, the state in which Bombay is situated. So he was able to understand much of what was being spoken and it stopped him in his tracks.